Universite De Douala edged Onyx 75-58 in 2018/19 opener. They trailed 13-16 at the end of the first period, but took control in the rest of the game. Universite De Douala scored 18 points in the second and then in the third periods for a 49-41 lead. Ekenguela top-scored for the winners with 22 points and Kene collected 15 points and 12 rebounds. Philippe Mbarga (188-F) scored 12, while Bassilekin and Bafou poured in 10 each. 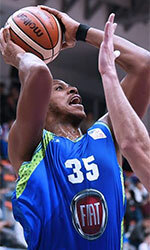 Siekou and Essome produced 12 points apiece in a loss.